Leading Manufacturer of surge protection device from New Delhi. HS50-50i, HS50-50i LED DS and HS55 are the lightning arresters type 1 according to EN 61643-11 and IEC 61643-1. 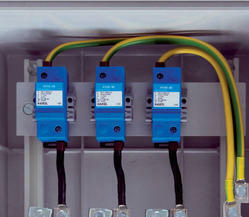 These are recommended for use in the Lightning Protection Zones Concept at the boundaries of LPZ 0 – 1 (according to IEC 1312-1 and EN 62305), where they provide the equipotential bonding and discharge of both, the lightning current and the switching surge, which are generated in power supply systems entering the building. The lightning arresters are constructed as the encapsulated, non-exhaust, multiple spark gaps, which do not have any special requirements for installation in the main switchboards in terms of the gas exhaustion generated during the passage of the lightning current. They are mainly intended for use in the power lines, which are operated as a system TN-C. For TNS and TT systems it is necessary to combine these arresters with single spark gap lightning arrester HS100i or JK110. The main usage of the HSlightning arresters is in those objects, which belong according to EN 62305 to the protective level LPL I.